After their story conference last Thursday, June 25, the lead cast of the upcoming film “Etiquette for Mistresses” was revealed together with director Chito S. Roño. The all-star cast consists of Queen of All Media Kris Aquino, Chinita Princess Kim Chiu, award-winning actress Iza Calzado, and Optimum Star Claudine Barretto. Claudine expressed her excitement over her big comeback and working with three of the best actresses today. She showed that by getting back to work right away to do their look test for the film. 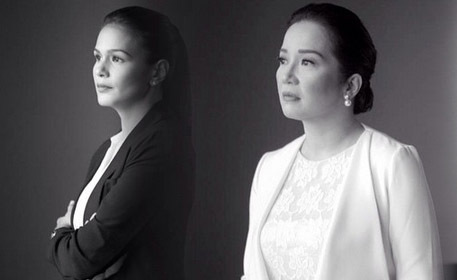 Cinematographer Neil Daza (@neildaza) shared photos from the look test and gave us a first glimpse of Kris, Claudine, Kim, and Iza in character for their roles in the “Etiquette for Mistresses,” on Instagram last Sunday, June 28. The ultimate online fan experience gets even better here at starcinema.com.ph. See other latest news here, visit our online store, and talk about your favorite stars, movies, and TV shows on Fans Speak!